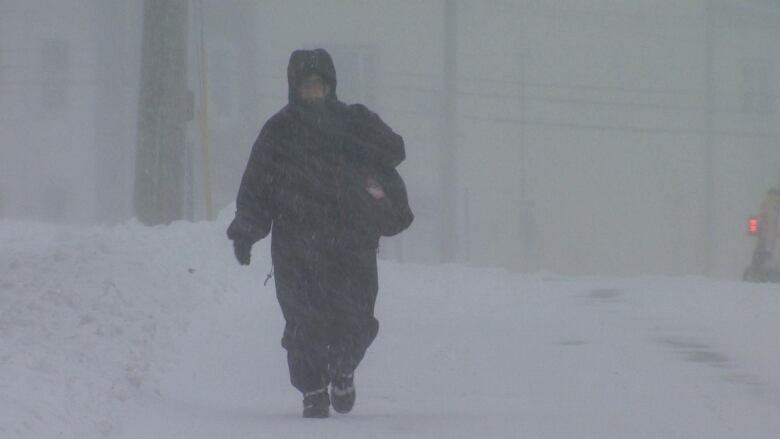 An extreme cold warning continues today in New Brunswick as Atlantic Canada prepares for Sunday's severe winter storm. 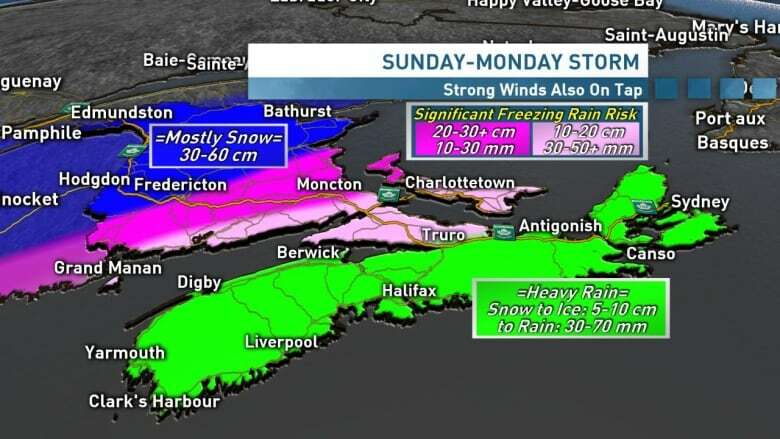 People across the Maritimes are being told to prepare for potential power outages as blizzard-like conditions and freezing rain are expected to sweep across the region on Sunday. Northern parts of New Brunswick may see up to 60 centimetres of snow, with 80 km/h winds creating whiteout conditions from Miramichi to Bathurst. It will be snowing over most of the Atlantic region by noon on Sunday. Nova Scotia can expect up to 5 cm of snow Sunday morning before the shift to freezing rain. An icy mix will move into southern New Brunswick and Prince Edward Island by evening. Ice pellets and freezing rain are expected for southeastern New Brunswick, with the most intense freezing mix expected to hit the Moncton and Saint John areas. Localized flooding is a strong possibilty in Nova Scotia and P.E.I. Dropping temperatures into Monday will create treacherous road conditions for drivers. Roads across the Atlantic provinces are relatively clear today. CBC meteorologist Ryan Snoddon recommends people plan to run any errands or make any trips Saturday, since road conditions will deteriorate Sunday as the low pressure system makes its way across the Maritimes. Here are the expected precipitation totals for the Sunday storm. "Today is the day to do some running around, albeit if you are running around bundle up because it is going to be bitter cold today," Snoddon said. Air Canada is warning flights in the northeast may be affected by incoming snow and winter weather conditions. Marine Atlantic has issued a travel advisory for North Sydney and Port aux Basques ferries. Ferries scheduled to depart from both locations Sunday at 11:45 a.m. will now depart at 10:30 a.m.
Snoddon said residents should stock up on food and essentials like batteries and flashlights. "As we roll into tomorrow there is the risk of power outages, especially Sunday night into Monday, and especially for New Brunswick and Prince Edward Island." NB Power has tweeted that it has 150 crews across the province ready to respond in case of outages. Nova Scotia Power has announced it will activate its Emergency Operations Centre at 10 a.m. Sunday to manage storm response. New Brunswick's Department of Transportation and Infrastructure will be testing a new NB 511 feature over the weekend. A new automated Twitter account, @brunswick511 will be pushing out transportation notifications during tomorrow's storm. The feed will not be interactive during this storm, but will generate notifications on road closures and travel advisories. In Nackawic, N.B., the Lions Centre will be the designated place to go to warm up, eat and charge phones in the event of an outage lasting more than four to six hours. Icy rain and high winds will increase the risk of outages in Nova Scotia and southern New Brunswick. An extreme cold warning is still in effect today for northern New Brunswick from Miramichi to Edmundston, with wind chill values near minus 35 today. Environment Canada recommends if you do go outside today to cover up. "Frostbite can develop within minutes on exposed skin, especially with wind chill," reads the agency's warning. People across the Maritimes are encouraged to watch the forecast Saturday for updates.